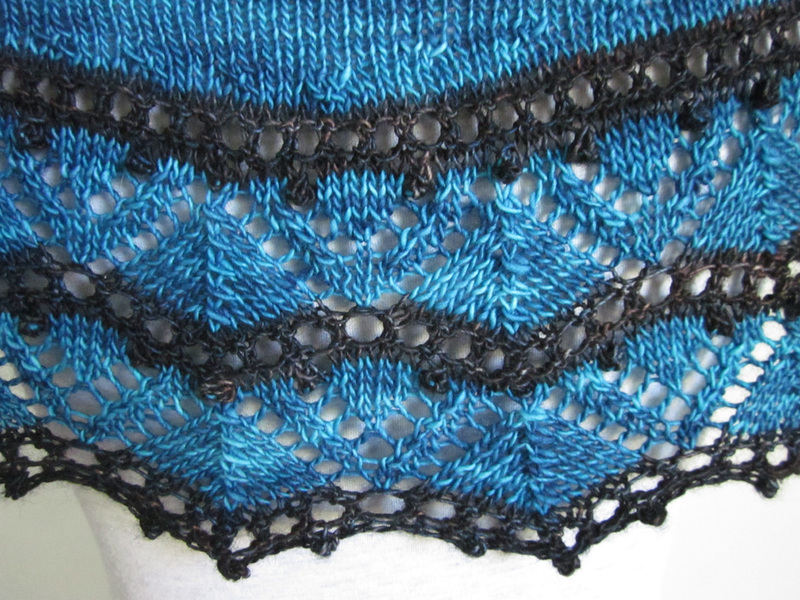 Djoser is a crescent shaped shawl worked from the bottom up with a two-color lace and bobble border and Stockinette stitch body worked in short rows. While working on this design, I became an armchair Egyptologist watching documentaries on the pyramids of Egypt. Inspiration for the name came from Djoser, the first pharaoh of Egypt to build a pyramid. With a lace pattern shaped like little pyramids and yarn as blue as the Nile, I couldn’t resist using his name for this shawl. Madelinetosh Tosh Merino Light (100% merino; 420 yds/384 m per 100 g skein); MC: baltic, 1 skein; CC: mare, 1 skein. 19 sts and 34 rows = 4” in Stockinette stitch on smaller needles.